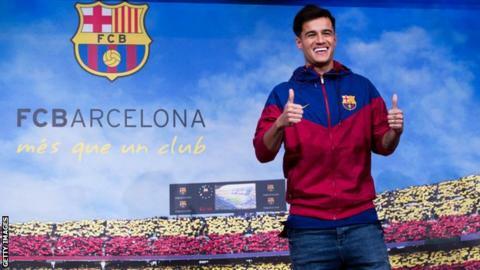 Brazil midfielder Philippe Coutinho says his move to Barcelona is a "dream come true" before his official presentation at the Nou Camp on Monday. The 25-year-old is set to join the Spanish giants after a £142m deal was agreed with Liverpool on Saturday. He took part in a brief photo session at the Nou Camp after Barcelona's 3-0 win against Levante on Sunday. "Footballers like Leo Messi, Luis Suarez, [Andres] Iniesta, [Gerard] Pique, [Sergio] Busquets. How big a loss will the Brazilian playmaker be for Liverpool? The playmaker will sign a five-and-half year deal and will have a buyout clause of 400m euros (£355m). It is one of the most expensive transfers of all time, eclipsed only by the £200m Paris St-Germain paid Barcelona for Neymar last summer, and the £165.7m Kylian Mbappe will cost PSG at the end of his initial loan spell from Monaco. Speaking after the Levante game, Barcelona boss Ernesto Valverde said it was "too soon" to determine where Coutinho will play in his side. It has been speculated that he could play alongside Lionel Messi and Luis Suarez in attack or become 33-year-old midfielder Andres Iniesta's long-term successor. "We can take advantage of his versatility," Valverde said. "He scores and sets up goals, and going forward he can help us a lot as he can play both inside and out wide." Valverde is confident Coutinho can improve a side that is nine points clear at the top of La Liga. "I think he can bring a lot to the team," he added. "He is here now, and good luck to him, because if he has luck then it will be good for us." Barcelona midfielder Paulinho plays alongside Coutinho for Brazil and is looking forward to linking up with his compatriot at club level. "He is a great player, a magnificent player," the former Tottenham player said. "I am certain he will really help Barca to attain our objectives this season. "We hope to see him playing for us as soon as possible." Read more on Philippe Coutinho: How big a loss will the Brazilian playmaker be for Liverpool?